The Danish Design 2 in 1 dog coat is a convertible coat that, can be used in either cold or warm weather conditions. 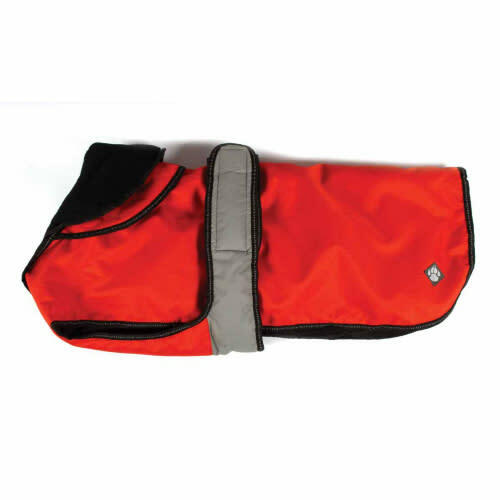 During winter, the polar fleece liner can be attached to the coat with easy fit Velcro strips. When it is warmer, the fleece can be removed and the dog coat converts into a light raincoat. You can be assured that your dog will have full chest protection with this coat and protection on a night with light reflective beading and light reflective fastening strap. The waist strap is also built in to help prevent side slippage and give your dog a snug fit. The exterior of the coat is made from fabric that is waterproof, wind-proof and breathable and ensures your dog is comfortable in any weather. Danish Design 2 In 1 Dog coats don't feature access points for harnesses. All Danish Design products come with personalised washing instruction, which can be found on label a sewn on to the coat. When measuring your dog for their new dog coat, it is important that you measure from the length from base of the neck to the start of the tail. This is where the head joins the body and where the tail joins the body. Make sure your dog is standing squarely upright on all four legs and is looking straight ahead for an accurate measurement. Secondly, measure the circumference around the widest part of the ribcage. Once you have done this you then need to refer to the size guide. If your dog's size does not match the size we have, then you should round up for dogs with downward tails and round down for dogs with upward tails.